All dogs need mental and physical stimulation. French bullogs often get in trouble when they have not had enough mental and physical activity… in other words, they get bored. There are various types of activities that you can do together with your Frenchie. Some love to chase and retrieve balls. Although, others will look at you like you have lost your mind if you throw a ball and think they’ll go and get it for you. h-a-h-a! Some French bulldogs love to just go on walks or play with a toy with or just with you. You & your Frenchie might enjoy a dog park and the social aspect of that type of outing. 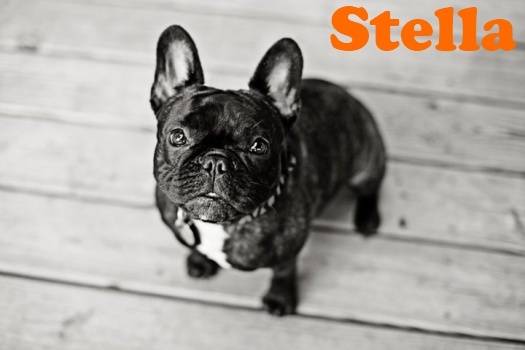 Your French bulldog can & should participate in obedience training. 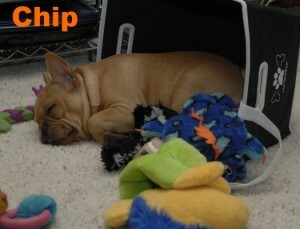 There are many levels of accomplishment and you and your Frenchie can choose how far you wish to take their training. Many pet stores have training classes. If you want to show your French bulldog check out the AKC show schedule on the AKC website. We have a link to the AKC website on our homepage. The MOST important part is finding activities in which the two of you can participate together. Fulfilling your French bulldogs’ need for activity is as important as affection and love. Ultimately, the time spent together will help you form a stronger bond with your Frenchie. As an added bonus, you will also have a better behaved dog. Remember, a tired dog is a happy dog. 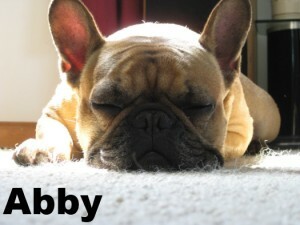 Send us a picture of YOUR happy dog…snoozing!